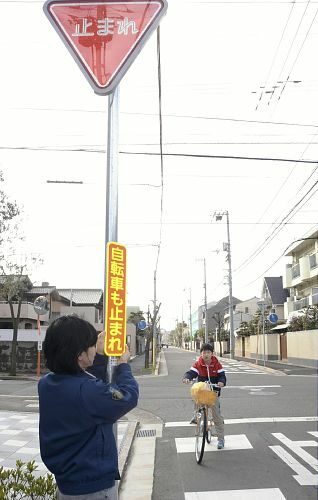 This morning I read an article on the Yomiuri website about local government efforts to reduce bicycle accidents at intersections by erecting signs urging cyclists to stop. I commented on twitter that it is a nice gesture, but that I'd like to see a national standard as too many prefectures around Japan are making up their own individual cycling policies with no overriding direction. Afterwards I re-visited the article and noticed the accompanying picture. Can you see what is wrong? Thats right, the cyclist in the picture is on on the wrong side of the road, if there were traffic on the road they would be cycling into it. Salmoning, if you will. So what is the photo telling us? That it's safe to ride on the wrong side of the road as long as we stop at the intersection and look both ways? Sorry folks, this is a bicycle safety fail. Tokyo has so far to go to institute some sort of real, uniformly and consistently enforced cycling policy, it will take years. One of the first things that could be tried is to educate the police themselves on how safely ride a bike. Cycling against the flow of traffic is illegal in Japan, not only that but its just a decidedly dangerous thing to do. Bicycles on the road are traffic and should behave as such. I'd recommend you go with the flow. I've come face-to-face with a guy bombing it downhill on the wrong side of the road in Kamiyachou, emerging late from behind a parked lorry ahead of a major intersection. I had to swerve into traffic to avoid him. Cycling safety phail.